Utility bills are increasing, fuel prices are increasing, driver costs are increasing, training regulation is increasing and complaints associated with the courtesy bus service are well increasing. If this sounds like a familiar mantra perhaps it is time to critically look at the sense and viability of your courtesy bus operations. So how can you get around this catch twenty-two? Courtesy buses became a mainstay of the Queensland hospitality environment by the mid-1990s in a bid to gain dominance over competitive venues. Today, larger clubs with over 30,000 members tend to operate one or more buses for patrons usage and will frequently foot the cost of a coach to collect larger groups. Few venues have a fleet of more than three buses or operate buses which can seat more than 12 passengers, as this is the critical mass which sits within the regulatory framework where a courtesy bus operation is still an ancillary activity and not a bone fide bus service. In looking at courtesy bus operations, the service is regarded as a promotional activity similar to drawing patrons into the venue by having entertainment or a band playing. However, a courtesy bus is ultimately more costly and risk-laden. While this service is attractive to patrons who are aware of the risks in driving while intoxicated or tired – surprisingly, many venues do not have policies or controls in place which monitor bus driver’s blood alcohol levels or ensure they are taking adequate breaks during their shifts. What if an accident involving a bus driver who is found to be driving while intoxicated makes the newspaper headlines? Not only would you be found guilty of neglecting the safety of your patrons, this scenario would have a devastating impact on your venue’s public image and could cost you thousands of dollars in damage control – with no assurance of your venue’s future viability. There is also the financial feasibility of a courtesy bus service. When assessing courtesy bus operations, it is worthwhile to keep a daily record of bus bookings. For example, Irene, who has been a loyal club member for 20 years uses the bus once a week and lives right on the cusp of the 5km radius reach of the bus route. After a few calculations you conclude that it takes 20 minutes for the bus to reach Irene’s house. You calculate that on average, she spends a further 50 minutes on the bus as it travels to four other patrons homes before returning to the club. This means that Irene spends a total of 1.10 hours waiting for you to deliver your services to her. So ask yourself, it this really the best use of a loyal patron’s time and is your courtesy bus really delivering the best service to them? 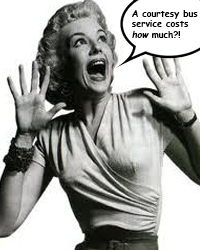 With increasing utility bills, fuel prices, driver costs, training regulation and a greater reach of members, maybe it’s time to critically look at the associated costs with your courtesy bus service and really question if it is delivering a courteous service to your patrons.